African American History Highlighted in Skinner Auction | Skinner Inc.
BOSTON, February 12, 2018. Significant and wide-ranging participation by museums interested in adding to their public collections led the Skinner February 9th auction of the Collection of Avis and Eugene Robinson. More than twenty-six cultural and educational institutions, in this country and abroad, vied to bid on items from the collection of artifacts, documents, and photographs chronicling the full scope of African American history from enslavement to emancipation, from Jim Crow to Civil Rights to the present day. In all, the collection formed a rich mosaic portraying the complex, often painful, often triumphant history of a people. DeWolf Archive, 18th to 20th century, sold for: $12,300. 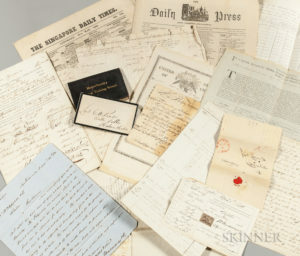 The auction’s top lot, selling for $12,300 in the room, was an archive of 18th -20th century documents and photographs from Rhode Island’s DeWolf family, the states most prominent family involved in the transatlantic slave trade. A framed “$100 Reward for Isaac Churcher,” went for $7380, while an 1833 broadside for the “Public Sale of Negroes” sold for $2583. Photography of all types was well represented. 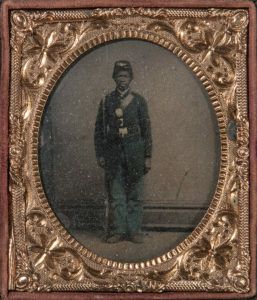 A tintype of an African American Confederate soldier sold for $9225, while another of a soldier in an infantry uniform went for $5535. The auction catalog cover lot, a tintype of a seated young woman reading a book sold for $6765. Twentieth-century images included two press photographs of Dr. Martin Luther King, Jr., that sold for $4613. Selling for $738 was a lot of sixteen press photos of Huey P. Newton, co-founder of the Black Panthers. Other top lots include a framed copy of Frederick Douglass’s The North Star newspaper that sold for $10,455. A braided leather mistress whip made $11,685, while a pair of Middle Passage bilboes went for $1722. A small triangular painting of figures in a bus by folk artist Mose Tolliver (American 1916-2006) sold for $6150, eking out a record for the artist. Finally, an Antar Daytl campaign poster of Barack Obama in 2008 with the motto, “Yes we can.” sold for $2583. This entry was posted in Blog, News and tagged African American art, african american documentrs, african americana, documents, early photographs, eugene robinson, historic documents by Kerry Shrives. Bookmark the permalink.